Today you get a very, very special guest post from my sister, Carolyn, who is as we speak probably hauling buckets of water to her hut for a bath or saving children from illiteracy. She’s pretty cool. p.s. If you want to ask her questions in the comments I’ll email them to her so she can answer and post her answers. Her internet access isn’t always reliable (SHOCKING) and I don’t think she has a fast enough connection to respond through the blog. Hii! This is Carolyn, Suzanne’s sister in the Peace Corps in Burkina Faso (West Africa) and regular reader of this blog. Suzanne asked me to write a guest post ages ago, and today I’m finally going to do just that. Honestly, the reason I was so reluctant to do this sooner (sorry Suz!) was because generally, I don’t think about babies. (This is probably a terrible thing to say on a baby blog, right?) Not really high on my radar. I am very far from being an expert; I feel like I don’t even know enough about them in the states to make legitimate comparisons between there and here. But here goes! Babies here are extremely cute. Unfortunately, they are usually terrified of white people, so they tend to start screaming at my approach. And making faces to get them to smile only makes it worse, as I discovered VERY early on in my time here. Every once in a while, on a bush taxi in particular (where they have many, many hours to get used to me) I get a baby who makes the sort of shocked face that’s usually a precursor to crying, but on rare occasions leads to smiling and playing peek-a-boo over his mom’s shoulder and all the women making arranged marriages between me and him. That’s when I like babies best. When women are pregnant here, it’s not usually talked about. Perhaps because of general silence on women’s issues, or maybe because of the risks of pregnancy here, I’m not sure. When a baby is born the customary gift to give the mother is soap. 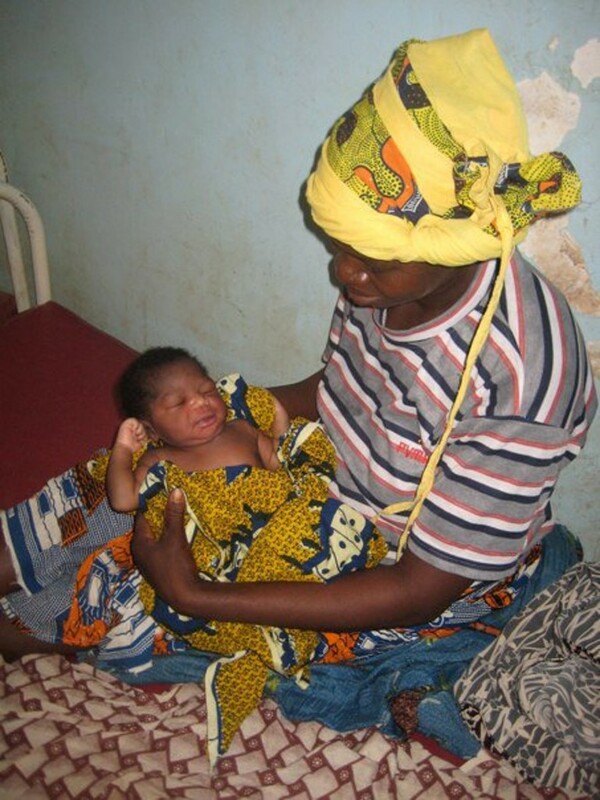 This is because in Burkina, there… aren’t diapers. Babies usually wear little western castoff outfits (very cute ones, actually) with shorts or pants or just fabric wrapped around them, so those layers get washed very frequently. Which uses a lot of soap. As soon as they’re walking, kids are essentially potty-trained because they can squat down wherever they want. A pagne is essentially just a length of patterned fabric, and is what all women use to carry their babies on their backs. You constantly see women with babies asleep on their backs- working in the fields, at the market, riding motorbikes, everywhere. There’s a routine motion that you notice of women bending forward and hiking their babies up, then re-tying the pagnes. (ed: Carolyn sent me several and I tried to carry Baby Evan Africa-style ONCE. It did not go well. I never made it out of the family room.) In cold season you see bulges on women’s backs with a tiny knit hat on top, the type with the puff ball attached. I should also mention that it’s not only women who carry babies like this. No, I’m not saying that the men do too (they absolutely do NOT.) Often older siblings, or I should say, sisters, carry the babies too. It’s cute, but maybe kind of sad, that you see tiny girls carrying babies almost as big as they are. Healthwise: If women go to the health center during pregnancy they can get prenatal care and can give birth with nurses, otherwise there are local midwives or just unassisted home births. 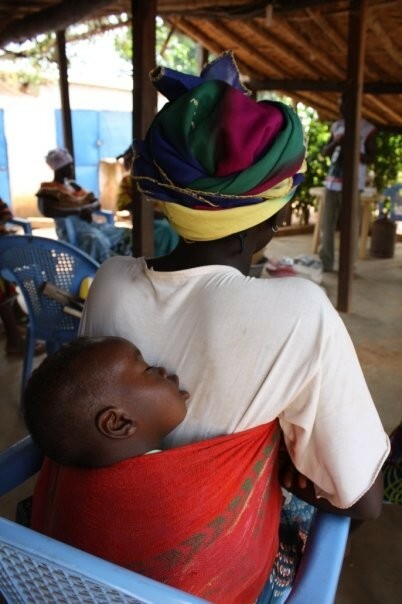 Once they have the baby they can go to the health center for vaccinations or to have their babies weighed (and get supplemental formula if the baby is underweight.) Peace Corps has a health sector here and one of the main focuses is child and maternal health, but since I’m a teacher I don’t have much personal experience with it (and even if I did, I imagine I would just have lots of really sad stories to tell.) A lot of child care depends on the economic situation of the family. Poor, rural families often can’t afford the small fees incurred at the health center, so they don’t go. Hey Carolyn! I really enjoyed the post. I hope you are enjoying your time in Africa!!! Thank you for sharing your experiences in Africa, Carolyn! I recently saw the movie Babies, and one of the families featured was from Namibia. It was amazing to see how different families can be and yet, be the same in so many ways. Thanks for sharing your experience Carolyn! My sister was in the Peace Corps in Mali (W. Africa) and I remember her telling me about pagne’s and how often you don’t realize a woman has a baby on her back when she’s walking towards you until you see 2 tiny feet poking out from either side of her back. That’s totally true! Yeah, Burkina shares its northwest border with Mali, I imagine life’s pretty similar here. Wow, this is fascinating! Thank you, Carolyn, for your insights. The 2nd picture made me smile–that mother’s world is so very different than what we know, but oh, a mother’s love is universal. What a gorgeous baby. Excellent post. I can’t think of any questions, but hope Suzanne will send along my compliments. What a cool post. I love hearing about how women raise their children in different cultures. It must be so neat to live among it. What a great post to read, too! I should probably stop writing outdated comments on your blog, but wow, this is such an interesting post. I really enjoyed reading it. I often wonder about babies in different parts of the world and being in Colombia for three months really made me think about the different ways of raising a child. YOur sister is great!